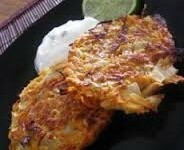 fine grated potatoes (clean skins may be left on) - 3 c.
grated onion - 2-4 tbsp. Ultimate Garlic Mashed Potato Seasoning - 1-2 tsp. Grate potatoes or put through a ricer. Drain, squeezing out excess moisture. Blend flour, salt, Garlic Mashed Potato Seasoning in small bowl. combine. Mix in dry ingredients, blending to coat all potato. other side until brown and crisp. Remove from heat, drain on paper towels and serve immediately. Seasoning and bacon bits) or applesauce, fresh grated apples or savoury jelly. Seasoning. 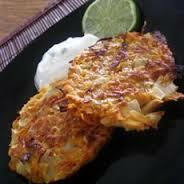 Serve potato pancakes with Horseradish Garlic Condiment.